[ACT](RC)[1/Turn] Generation Break 1 (Active if you have one or more face up G units in total on your (VC) or G zone):[Soul Blast (1) & Choose one of your other rear-guards in the same column as this unit, and retire it] Draw a card. 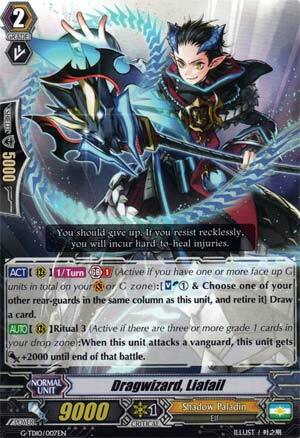 [AUTO](RC) Ritual 3 (Active if there are three or more grade 1 cards in your drop zone):When this unit attacks a vanguard, this unit gets [Power]+2000 until end of that battle. Okay this one has a bit more merit. Liafall's ACT GB1 is to Soulblast 1 and retire one other rear-guard in the same column to draw a card, once per turn. His Ritual gives him 2k when he attacks. He's not here for the columns. Here's here to initiate a near-insta Ritual by murdering your Grade 1 and Soulblasting your Grade 1 ride. That's okay I guess. With that said, with the current Ritual build, I'm not convinced. Although hand conversion is a good tactic as it lets you rush reasonably guilt-free, it's already good at hand advantage and it's pretty soulblast heavy. Beyond a quick Ritual this is going to be vanilla and clash with the rest of your stuff. It's okay, but not brilliant.